Chorus: Oh mv darling, etc. Fell finto the foaming brine. Chorus: Oh my darling, etc. Chorus: Oh rny darling, etc. Now she's dead I'll draw the line. 2. Forty-niner: Fortyniners were the men who went to west in search of fortune during the gold rush of 1849. When gold was found out in California, thousands of people rushed there. They travelled by boat, on foot, on horseback, to reach the gold fields where they hoped to make their fortunes. Towns were built overnight and San Francisco grew from a small town to a city of 25,000 in a year. 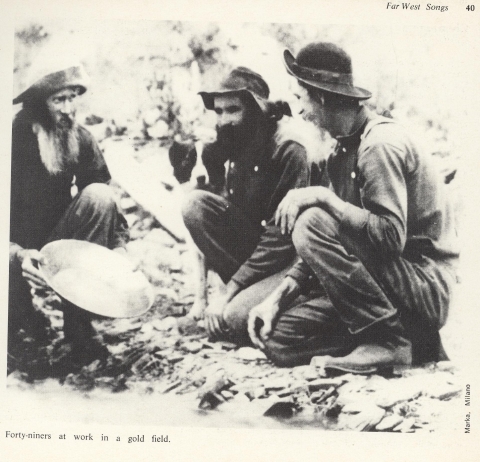 Later, other gold fields were found out in Colorado as well as in the Klondike district of the Yukon. Not ali the people became rich. Many died along the way from cold, hunger, or disease, but some probably made as much as 5,000 dollars in three days. The city of San Francisco lies on a peninsula between San Francisco Bay and the Pacific Ocean. It is linked to Marin County to the North, through the famous Golden Gate Bridge, and to Oakland, one of the largest cities- in California, through the San Francisco¬ Oakland Bay Bridge, which is more than eight miles long. In 1848, when the Gold Rush started, San Francisco was a little village with no more than 800 residents. But, since then, many events such as the Gold Rush, the Opening of Panama Canal in 1914 and World War Il have contributed to make of this city a place with about 1,000,000 residents. During the years people from different countries have settled in San Francisco, and the city is now really cosmopolitan. San Fran¬cisco has a unique charm of her own, and her two famous bridges as well as the charac¬teristic trams, or cable cars, as they are usually called there, add certainly a lot to this charm. Especially the trams, which are convenient and practical and clang loudly as they transport thousands of passengers daily up and down the steep ascents and dis¬cents of this city of hills.